Grounds for Reconciliation: Some Preliminary Thoughts on Cognition and Action (A. Colley, J. Beech). Programming and Co-ordination. (Contributors: N. Harvey; P. Bairstow; W.D.A. Beggs, C.I. Howarth; W. Hulstijn, G.P. van Galen; B. Sidaway, R.W. Christina, J.B. Shea; D.M. Frohlich; S.P. Swinnen, C.B. Walter; J. Annett). Motor Systems and Action Systems Approaches to Motor Control. (Contributors: M. Sheridan; R.G. Marteniuk, C.L. MacKenzie, J.L. Leavitt; M.T. Turvey, C. Carello; Y. Guiard; P.J. Beek; P.C.W. van Wieringen). Learning and Performing Skilled Movements. (Contributors: H.T.A. Whiting, G.J.P. Savelsbergh, C.M. Faber; R.G.J. Meulenbroek, G.P. van Galen; M. Buekers, J. Pauwels, P. Meugens; J.I. Laszlo et al. ; K. Flowers). Cognitive Processes in Skilled Performance. (Contributors: J. Phillips, B. Hughes; E. Limons, J.B. Shea; C. Miles, C. Madden, D.M. Jones; R. Logie et al. ; K.J. Gilhooly, A.J.K. Green; A. Colley, J. Beech). This book contains a number of chapters on the control and execution of skilled movements, as well as more general chapters on theoretical issues in skilled performance. The contributors have summarised their most recent research, and general themes and issues are presented in discussion chapters at the end of each section, thus providing a good general summary of the kind of research and theoretical frameworks developing in this area. The first section is concerned with the theoretical issues of programming and co-ordination. Issues raised in the second section are basic to much of the research reviewed in the volume. This section summarises the various theoretical positions in the recent debates on the role of cognitive processes in motor control and the usefulness of the psychomotor'' approach, and contains chapters based on individual papers which present relevant empirical findings. The third section deals with the learning and performance of skilled movements, containing papers with practical implications for everyday skills. 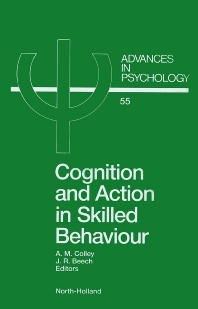 The final section contains chapters on cognitive processes in skilled performance.